My poor Maisie girl broke her leg sometime between Tuesday night and Wednesday morning. We have seen a vet and they put basically a swab stick and tape splint on her little leg. My question is, has anyone else had this type of fix for a broken leg, and did you have a rough time with them wanting to take the splint off? I've read on here about the e-collars and jackets. The vet tried making and putting an e-collar on her, but she wiggled out every time. Are there any other tips? Also, as far as behavior goes, has anyone had issues with them not eating properly during this? I haven't as of yet, but we have her in a separate cage from our other babies for now, and I am concerned about her getting depressed. She's eating as of now, I'm just kind of wanting to be prepared for anything. 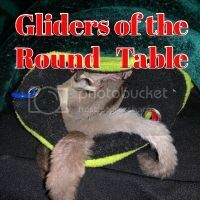 Another glider owner I work with has been discussing her experience with injured babies, but of course the more info the better. Last edited by wvglidermomma; 04/05/19 11:18 AM. Was this a front leg or a back leg? Front leg would mean an e-collar. Back leg you could probably use an e-jacket. Those you would get from minkasmom Denise Rainwaters. Her phone number is in her profile. I know of a couple that healed up with a splint and I know of others where they just amputated the leg. It heals faster when amputated and they get around just fine on three legs. Please keep us posted on your little one. It’s her front right. So far it’s been 2 days and she still has the splint on, the vet wants to see her next Wednesday for a follow up and to replace it with another one. He also wants us to up her calcium slightly right now to help strengthen the bone as it hopefully heals. Thank you, I’ll keep you updated! So an update, we went to the vet last night for a checkup. She took off her original splint and we got a second one put on last Sunday. That one is still on and the vet says as long as it stays on through one more week, he'll take it off next Wednesday. I am thankful it'll only be one more week, she misses her family dearly. The vet advised trying supervised play time with her original cage mate, Finn. We tried this, but he just kept trying to chew off her splint, so we had to separate them again. I'm excited for next week so I can get my babies back together and happy. 0 registered members (), 17 guests, and 274 spiders.